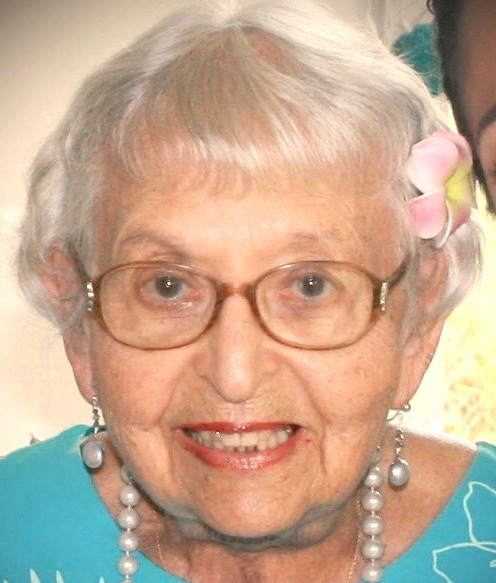 Bernadette Victorino Burke, age 86, died on July 15, 2018 at her home in Kailua. Bernadette was born on June 7, 1932 in Kilauea, Kaua'i, the daughter of Ernest R. and Albena M. Victorino. She was a graduate of Sacred Hearts Academy in Kaimuki and Mount St. Mary's College in California. She married Samuel E. Burke on June 18, 1960, at St. Catherine's Church in Kapa'a. They settled in Kailua, O'ahu, where they raised their four daughters. Bernadette taught band and general music throughout her career in the state of Hawaii for 37 years. She retired in 1992 from Samuel Wilder King Intermediate in Kaneohe. Bernadette is survived by her four daughters, Luanna Burke Goltry (Michael Winfield), Ernesta Carmelle Shupe, Victoria Burke Villegas (Ricardo), and Rhoda Ann Cleek (Tom "Ronnie"), her brother Bernard S. Victorino (Genevieve), and ten grandchildren: Milan Hila'i Burke, Thomas-Ryan Lawakua Cleek, Natalia Anuhea Villegas, Samantha Makale'a Cleek, Siena Mahealani Shupe, Isabella Emalia Villegas, Gwynethe Moanike'ala'oka'awapuhi Goltry, Hazen Anthony Ke'ale Shupe, Sydney Maliekekaimekamakani Goltry, and Sophia Kahiau Cleek. Services will be held on Monday, July 30, 2018 at 9:00 a.m. at St. John Vianney Church in Kailua with burial to follow at Punchbowl Cemetery.